In addition to my 9 to 5 job, I am big believer in investing your time, skills and resources to causes that you and your family are passionate about. It can be a truly rewarding and inspirational way to celebrate and recognize organizations that have made a positive impact on issues ranging from poverty, health, educations and so much more. What is your passion? What causes are important to you? For Kristian and I, one of those causes is cancer research and care. 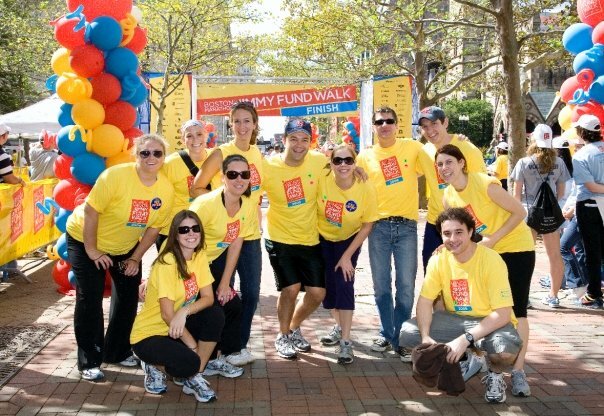 We both are dedicated volunteers for the Jimmy Fund, members of the Dana-Farber Leadership Council and are walking in our 5th Annual Boston Marathon Jimmy Fund Walk (R) this Sunday, September 9th. This important fundraiser continues to be one of our favorite Jimmy Fund events because we get to walk side-by-side with courageous patients and their families while raising funds to conquer cancer. Cancer has impacted both of our families in a powerful way and with every step we take, we remember loved ones who have made a positive impact on our lives and battled a wide variety of cancers. I am writing today to challenge you to think about your passions and how you might contribute to your community. Maybe you can volunteer at your local MSPCA, Food Bank, Girls & Boys Club or even a State Park. If you are short on time, think about making a financial contribution to your alma mater’s scholarship fund, your local hospital that helped you during a tough time or your church’s next high school mission trip. If you are unsure where to start, try by checking out Kevin Bacon’s SixDegrees.Org. It is a fantastic online resource that helps identify a charity that you might be interested in volunteering with or even planning a social fundraiser for. Definitely check it out. I would love to hear more about our readers passion? Posted in Giving with Grace, JubileeTagged Cancer research, Charity Walks, Dana-Farber Cancer Institute, Dana-Farber Leadership Council, donations, Kevin Bacon, Six Degrees of Seperation, The Jimmy FundBookmark the permalink.